Facebook is striving to assuage those criticising the social media platform for displaying “double standards” in launching its Safety Check feature, which was activated during the attacks in Paris late Friday, but not during the attacks that shook Beirut the day before on Thursday. The company activated the feature for the first time in a non-natural disaster incident during Paris's series of coordinated attacks that left at least 129 dead in the French capital, making it the worst attack in Europe since the 2004 Madrid train bombings. The company's decision sparked controversy online as the company's activation of the feature came only after attacks in Paris, and not after Lebanon's twin suicide bombings that killed 43 people in central Beirut on Thursday nor in Baghdad's attacks that killed 19. Facebook's chief executive and founder Mark Zuckerberg said in a Facebook comment that after the Paris attacks, the company decided to change their policy regarding the now widely used safety check and now plan to activate the feature for more human disasters going forward as well. More than four million people used the Facebook feature to let friends and loved ones know that they were safe following the attacks in Paris. Until Friday, the Facebook feature was reserved for natural disasters only. "There has to be a first time for trying something new, even in complex and sensitive times, and for us that was Paris," Shultz said. The popular social networking website illustrated why the Safety Check was never applied in a non-natural disaster incident before. "During an ongoing crisis, like war or an epidemic, Safety Check in its current form is not that useful for people: because there isn't a clear start or end point and, unfortunately, it's impossible to know when someone is truly “safe,” Shultz said. 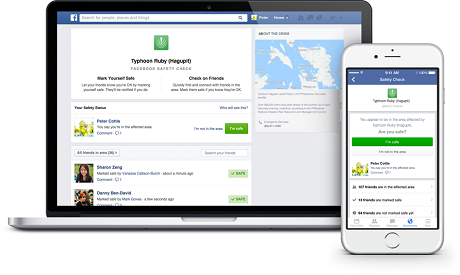 Facebook was first inspired to create an early version of the safety check in Tokyo during the Tsunami and nuclear disaster in 2011. The company then deployed the feature for the first time in October 2014 and has since activated it five times in recent earthquakes in Afghanistan, Chile and Nepal as well as Tropical Cyclone Pam in the South Pacific and Typhoon Ruby in the Philippines.